Photo 010. Adolf Hitler Inspecting the Bismarck. Adolf Hitler inspecting the Bismarck on 5 May 1941. 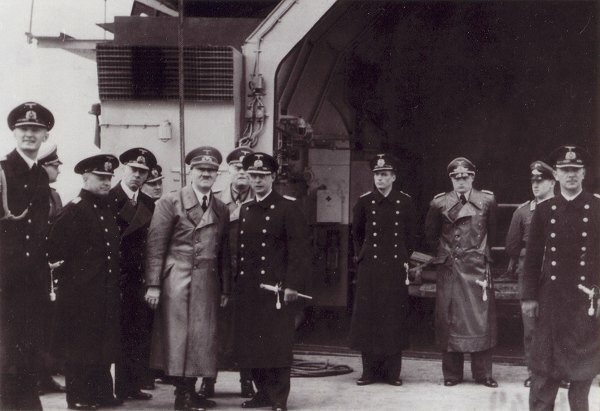 Several men can be identified (from left to right): 1 Fregattenkapitän Karl Jesko von Puttkamer, 2 unknown, 3 Kapitän zur See Harald Netzbandt, 4 Admiral Günther Lütjens, 5 unknown, 6 Adolf Hitler, 7 Generalfeldmarschall Wilhelm Keitel, 8 Kapitän zur See Ernst Lindemann, 9 unknown, 10 unknown, 11 unknown, 12 unknown. Discuss about this photo here.